In just a few hours, at midnight tonight, our Cyber Monday sales offer will end. It’s crunch time, time to make a decision…. The CD is shipped in a 4-color CD/DVD case that looks great and is suitable as a Christmas gift. Use the link below to grab this special Black Friday / Cyber Monday offer. If you’ve been waiting for a great price on Video Surgeon, this is the best one you’ll see for the holidays so grab it now while you can. It won’t last long. And in case you’ve forgotten what Video Surgeon does, it allows you to zoom in, slow down and loop the video all at the same time, making learning much easier and quicker. Though I am confident you’ll never need it Video Surgeon, like all of our products, comes with a 60-day, no-questions-asked, refund policy. These special prices will end tonight, in just a few hours, so don’t wait, enjoy big savings and put Video Surgeon to work for you today. p.s. Don’t take our word for it, take a quick read of some of the comments below from Version 2 customers. Recently I’ve been rediscovering the joy of covering Motown and rock classics. Youtube is a great source of “lessons” so I use the sniffer to pull the song into whatever format sniffer recommends at the top (usually mp4) and then import it into a project. I bought both Song and Video Surgeon. I haven’t gotten sniffing working for Google Play Music All Access I think because I haven’t sorted out how that would work when I have my USB audio interface plugged in (Lexicon Alpha). I use that at all times so I can plug my bass in and control mix of it against the computer audio (VS, SS, Youtube). I use a Sansamp Bass DI, output is to a pair of Tannoy monitors. Video Surgeon really saved the day when I recently got a last minute call to perform at a charity event. I never learned covers so fast. Thanks for creating the program! 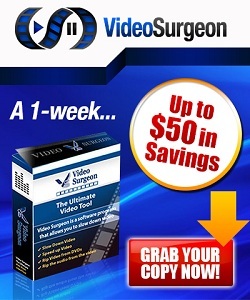 I have had Video Surgeon for many years and upgraded to version 2.0 when it came out. I use it exclusively to play music. I use it to practice our band’s tunes. Have also used online tunes to get ideas and to be able to observe what they do on for example, guitar or bass. It is a phenomenal program! My favorite feature is “zoom” so I can get right to what I need to see as close up as I need. The support also has remained consistently excellent over the years. I particularly like the training videos, which I return to often, when I have forgotten how a particular feature works. A FIVE STAR rating for your software and tutorials. (And I received the Video Surgeon software program on CD along with the special offers in about four days which was a pleasant surprise since I live in Canada. So Five Stars also for the fast shipping). The dog days of summer are upon us. I know this by not only looking at the calendar, but also by the activity on our website and Help Desk. This also means a slow down in sales. As we have in previous years we are again running a “dog days” sale. This year it’s a bit different though. In addition to Video Surgeon we have a number of other products. These products typically sell for $19 – $39, however for the next couple of weeks you can grab any of the 5 titles listed below for only $9 each. I have provided a brief description and a sale link for each. This weeks video tip was spurred by a recent question at the Help Desk. It is about zooming in and out in the timeline area. This allows you to more precisely set markers, loop points and even selection areas for editing. The video below demonstrates how to do this. As mentioned previously, we are making some changes and expanding the focus of Video Surgeon to include non-music markets. Don’t worry, almost all of our products are focused on audio and music. We are not abandoning the music segment, only expanding to others. Existing Version 2 customers won’t see any changes. If you are a version 1 customer or are considering buying the product you will see a gradual increase in price up to $147. The other thing that we will be rolling out are two new product offerings: Video Surgeon Plus and Video Surgeon Agency. Private VIP Access via email where you can contact me directly and get personal, 1 on 1 answers to your questions for a 1 year period. Access to our Members Only Facebook community where you can ask questions, interact with other Video Surgeon Plus Members, and see the latest news, technical information, and education/training videos. Access to the Video Surgeon Plus Skype Group where you can chat with video surgeon members and experts. Preferential Assistance at our Help Desk, which includes priority ticket responses and responses on weekends. Video Surgeon Agency is a product geared toward websites and business that want to offer Video Surgeon to their customers/employees. This product will contain licenses for 100 users of Video Surgeon. Both of these new products should be available by early fall. The dog days of summer are upon us. I know this by not only looking at the calendar, but also by the activity on our website and Help Desk. This also means a slow down in sales. As we have in previous years we are again running a “dog days” sale. This year it’s a bit different though. In addition to Video Surgeon we have a number of other products. These products typically sell for $29 – $49, however for the next couple of weeks you can grab any of the 5 titles listed below for only $9 each. I have provided a brief description and a sale link for each. is our entry level audio slow downer. And today, you can grab it for just $9 bucks, a 70% discount off the normal price. Song Surgeon Trainer changes key and tempo, allows for the creation of one looping area for repetitive playing, and has a 9 band EQ. All of these features can be applied real time. Trainer is an inexpensive program that allows musician access to the power of slowing down and looping audio as a learning tool. A survey of our customers have shown that slowing down the audio can increase your ability to learn a song, riff, or segment by an average of 614%. The biggest difference between Trainer and the other two models is that Trainer doesn’t have the ability to save changes to a file. Unfortunately for music lovers and musicians, YouTube and other video sharing sites don’t accept audio files. Before audio or music files can be uploaded to YouTube, you must first make a video that incorporates the audio file. There are many software programs available for creating videos, some are quite sophisticated, expensive, and difficult to learn. Others are less expensive and simpler, but still require a modest learning curve. SlideTrax is an inexpensive software program that effortlessly allows you to create a video from your audio files. It almost completely circumvents any learning curve. All you need to be able to do is Drag and Drop an audio file, image (picture) file, and add optional text – and then click the Create button. SlideTrax will make a video file (we call this a SlideTrak) that can be uploaded to YouTube and many other video sharing websites. This is a Win only product. Download Surgeon and it can download ANY file on YouTube – and not only can it download the video – it can also strip the audio from the video and save it as an mp3 file. So whether you use audio or video, Download Surgeon can turn YouTube into your own personal library of audio and video files. 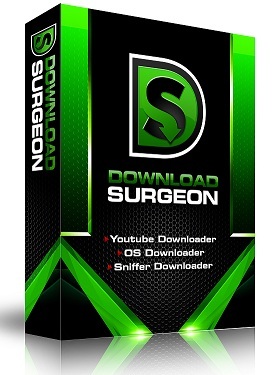 Download Surgeon also has the ability to download from 1000’s of other sites. Now let me be very clear, it cannot download from every site – some sites are built or coded in such a way as to prevent Download Surgeon from working – and this includes some of the major sites that stream audio and video – but Download Surgeon can and does download from thousands of sites. that you’d like to convert to a single standard audio format (like mp3, wma, m4a, etc.) this handy little utility can easily do this for you. In addition, it also performs volume normalization, allowing you to adjust all of your files to the same relative loudness or volume. Whether you have 5, 50 or 5000 files, they are no problem for Audio Switch. Like all of their products it comes with a 90 day, 100% money back guarantee so you can buy with confidence. This is a Win only product. The Guitar Leads Master Volume is a massive guitar riff’s library with more than 425 riff/lead segments. This is no ordinary riffs package. Each riff contains interactive audio at both full and half speed. Once started the audio will play repeatedly until you stop it. And of course the 1/2 speed audio makes it easier for you to follow along and hear exactly what’s being played. But there’s more: Each riff comes with accurate tabs. This library installs like software on either a Mac(Osx) or a Windows machine and you access the individual riffs through an table of contents or index page that is displayed in your browser. February has been a bit of a slow month for Video Surgeon. There has not been a lot going on. There have been no major problems or bug fixes to report. We are running a couple of surveys for which I hope you can spare a minute. One is on features for Version, and the other is about a potential new product for Karaoke users. If you’re a Windows user, you’ve may encounter an iPhone video that seems to be upside down when you save it to your computer or play them in Video Surgeon. Why does this happen? Simply put, it is because you can rotate your iPhone. Your camera sensor doesn’t know when you have done this, it simply records the video or image and save it to a file, letting the software on your phone do the rest.To make sure that your photos are displayed correctly, your iPhone adds information about the correct rotation of the photo or video to the properties which are specified in EXIF tags. We are more than a year away from a new version, however, it is time to begin thinking about possible new features. We rely heavily upon the input of our customers when we develop new versions, so please take a couple of minutes and complete this survey. Thank you in advance for you input. I have mentioned Download Surgeon over the past several months in this newsletter. It is NOW available. DS is an tri-module A/V Downloader.This product is similar to the download module found in Video Surgeon 2, though with some changes and improvements. If you own Version 2, you will need determine whether the modest enhancements found in this product are worth the extra dollars. That is a decision for you to make, not us. However, if you have a the older version of Video Surgeon or have been a demo user – and you are looking for a way to download audio and/or video from YouTube, Face Book, Tumblr, Sound Cloud, Reverbnation, and thousands of other sites, then I encourage you to give this a look. One other difference is that a purchase entitles you to install on only one machine, not three as we do with Song Surgeon. Download Surgeon runs on both Windows and Mac (OSx) machines. Download Surgeon comes with one full year of support – and like all of our products is backed by our no-hassles guarantee policy. If for any reason during the first 90 days you are not satisfied, contact us and we’ll refund 100% of your purchase, no questions asked. I know we have many Karaoke users among Video Surgeon. If you are one, I’d like to ask a favor. We are exploring the possibility of creating a product solely for Karaoke singers. Please take a minute and respond to our survey on this potential product to help us better understand your needs and what features you would want in such a product. p.s. As we customarily do in this postscript section of the letter, here is a recent email we received from a VS user. Thank you Jim. It really means a lot that your “service level” is so superb. One of the best in the World. We are running a couple of surveys that I hope you can spare a minute for. One is on features for Version 3.. and the other is about a potential new product for Karaoke users. Also, work continues on the new Download Surgeon product which we have mentioned in this newsletter before. Working with DVD’s can be difficult for two reasons. One, each DVD consists of multiple .vob files, and it is difficult to find or determine which of these files contains the video segment of interest. The second issue is file size. DVD .vob files can be as loarge as 1 GB. Files of this size will take a considerable amount of time to open in Video Surgeon. This weekly tip shows you how you can open .vob files found in a DVD and consolidate this into one single file using Video Surgeon. Beta testing for this new product will be underway this week. Download Surgeon is a spin-off of the sniffer technology found in Video Surgeon with some change s and improvements. This new product utilizes 3 separate download options. Two of these are the same as the two found in Video Surgeon. The third is a new module that initially will download from 9 or 10 specific sites – such as Soundcloud, Reverbnation and Ustream and Face Book to name a few. Overtime we will add new sites to this downloader. When Version 3 of VS is released at some point in the future, this new technology will be incorporated into Video Surgeon. We are running a couple of surveys that I hope you can spare a minute for. One is on features for Version 3.. and the other is about a potenial new product for Karaoke users. Also, work continues on the new Download Surgeon product which we have mentioned in this newsletter before. There is an update on the status below as well as a call for beta testers. We have had several help desk tickets dealing with the issue of ripping a DVD. I thought it would be helpful to have your review our Training Video on DVD ripping to help users get up to speed. Here is the link below. In addition to ripping a DVD, you also have the option of browser to the DVD and grabbing a .vob file and dragging it to the main VS interface. This will open the file. Remember, that when working with .vob files from DVD’s, they are often very large — up to a GB. Because of their size they can take a long time to process and open! By the time you are reading this I hope to have a beta version of this product on my desk. Download Surgeon is a spin-off of the sniffer technology found in Video Surgeon with some change s and improvements. We are looking for 10 windows and 10 Mac users to be Beta Testers. Beta testers are required to spend 4 hours testing the new product and reporting any issues or bugs. In exchange for testing the product, beta testers will receive a free copy of the product. If you are interested in being a beta tester, please contact us at info@Videosurgeon.net. I am a solo jazz guitarist and I use Video Surgeon for learning complex jazz guitar songs that otherwise would be out of my reach without sheet music. For example, the day after I purchased Video Surgeon, I ran across a video of a song that I just HAD to have in order to perform it in Christmas concert that I had been invited to perform in. I wrote the artist in the video and he wasn’t able to provide me with the sheet music due to copyright issues. So I used Video Surgeon to rip it from YouTube, slow it down, zoom in and learn it note by note, chord by chord. And, only with the help of Video Surgeon I was able to learn this HUGE song for myself and perform it live in the concert last weekend. This is only one example of music I’ve been able to master using this software. Wow! In just a little more than a week it will be Christmas. I can’t believe it; 2014 has flown my so quickly! In order to get everything to you — Wednesday the 17th will be our last shipping day before Christmas. That means that all orders for Christmas MUST be placed by MIDNIGHT on Tuesday the 16th. And that means that all Christmas promotions will end at midnight as well. That’s a $50 savings if you order the CD version – a discount of 40%. PLUS —- We offer $4 flat rate shipping anywhere in the world. Here is wishing you and yours a healthy, happy, merry, and blessed Christmas. 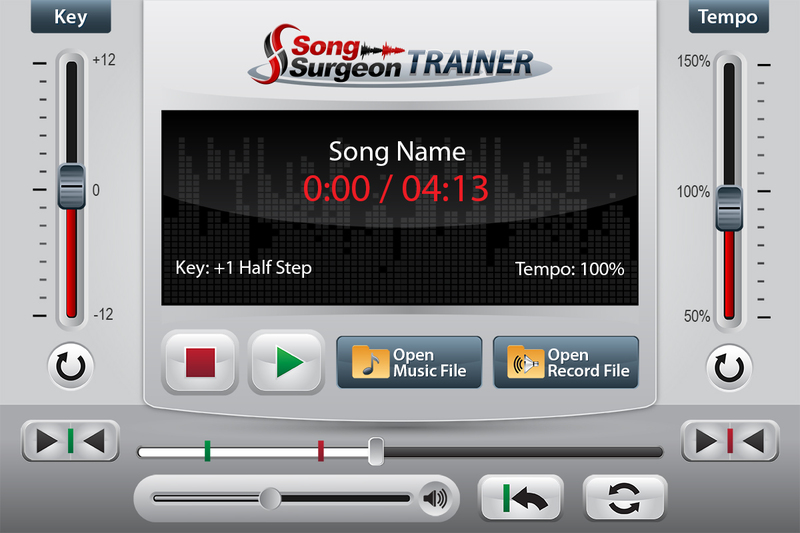 Song Surgeon – This is the companion product to Video Surgeon. It is an audio slow downer and you can grab it right now and save up to 50% discount on the price of the Standard model, plus the CD version is available for only a buck, in case you want a physical product to put under the tree. SlideTrax – This is one of our newer products that enables a user to make a quick and simple video from any audio file. The resulting videos are compatible with and can be uploaded to YouTube and Face Book. It’s a very handy tool for musicians who have an audio file of music they’d like to share. We are offering a 50% discount.